However, there’s no way around the current situation...just through it. And, although I have had multiple meltdowns this week and more than a few things have gone wrong (way wrong) we’re getting there...I guess. Monday started all too early doing chores in the rain so the Boss and I could head over the mountain to Cville for his follow-up appointment with the surgeon. After four weeks, he’s healing well and has been given the green light to start returning to “normal” activities on May 8th. And, yes, “normal” is in quotes. Because, after a major surgery and six weeks of forced inactivity, the word is going to have be re-defined. Even if it is for a short while. (and I’m writing that as a reminder to the Boss) The challenge now will be to get his strength and stamina back. The healing of the big incision is the last obvious hurdle, leaving us in a “wait and see” mode. Since the liver regenerates, creating new tissue all the time, radiation and/or chemo are not general treatment options as either could potentially affect the cells forming the new tissue in an adverse way. So, that leaves close monitoring as the real choice. The Boss will head back for an MRI every four months for the next two years. At that point, if everything remains clear, the time between scans will be lengthened. But, he will remain under watch and care for 5 years. While it may seem that he “got lucky” because he doesn’t have to do chemo or radiation, this saga isn’t over yet. Not by a long shot. We don’t know (and will never know) what caused this issue. And, there is no sure way to avoid it in the future. I’m afraid it will hang like a specter, hovering at the edges of everything we do. But, again...no way around it...just through it. Blondie came by Monday afternoon to help me work the sheep (again). We really needed to wean the lambs. This allows the mamas to recover some of their body condition prior to shearing. (good body condition is imperative to a good breeding season in August) And, it would allow us to have two separate groups grazing the abundant grass…because any more mowing is not an option. But, it was raining. I mean really raining. That kind of cold, soaking rain that leaves you just wanting to curl up and nap somewhere. However, there was no time for napping. Then, there was one lamb that needed a little more attention than the others. Ordinarily, we band-castrate all the ram lambs when they are about one month old. Occasionally, for one reason or another, (I will spare you the details) they aren’t ready and we have to wait. No problem, make a note and get them next time. Except that somehow one got overlooked. Twice. So, now he wasn’t so small and it was going to be a little more difficult to complete the job. No problem. Blondie could help me. 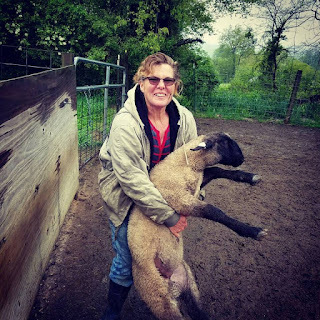 The lambs were wet and the barnyard was a slippery, sloppy mess and I had already caught one lamb in what became an all-out rodeo deal, and they were all beginning to stress as they realized the separation was permanent. So we decided to skip any further excitement. But, that lamb really needed attention. I realize this sounds gross. (and I reckon it actually is) but, it’s one of those farm chores that has to be done, so we steel ourselves and do it. Except when it gets overlooked. Twice. I finally decided that no amount of rain and mud was going to stop me. And, help or no help, it HAD to be done. I figured I could just push the lamb up next to the fence, pop the band on and go on about my day. A slight oversimplification. The lamb was bigger than I had imagined. Meaning that the part that needed my attention was also (much) bigger than I imagined. Eeks! Long story short, I caught that 70-pound lamb by his back foot, rolled him on his back, and took care of business...in the muck and pouring rain without hurting him or myself. Yes! I must admit, weird as it may sound, I am pretty proud of that feat. But, not before I potted up all the tomato plants. After four days of rain, it was far too wet to work outside, so I finally got to the hoophouse. YAY! Part of what is making this entire situation so hard is the continual explaining of our lack of greens at the Market. Ordinarily, we have lots of greens for the early season market. LOTS of greens. But, between the rat issue earlier in the year and the Boss’ surgery...the only thing growing in the hoophouse is a bumper crop of weeds. Verdant, abundant WEEDS. The next day, the sun came out. It was a beautiful day. I didn’t even think about the problems of a beautiful sunny day. And, with the sides down in the beautiful sunshine...it was getting hotter and hotter. My baby plants were cooking in the heat. after watering, it still looks "melted"
With some emergency watering, a complete crisis was averted. There was some loss, but it wasn’t the total devastation I originally feared. In hopes of preventing more plant cooking (and personal melt-downs), I figured we could put the shadecloth on the hoophouse. I could do a fair amount of the work, if the Boss could come out and advise and tie knots. The Boss said NO problem. He’d handle it. Just call the supply company. He couldn’t get any for about 3 weeks. Well, that wouldn’t help. Okay. Order online. This company is quick…no problem. Until the confirmation email came…you guessed it. Shipping would be in 2 to 3 weeks. At that point, the weather forecast was saying near 90 degrees for the weekend, dooming my lettuce for certain. It was time for action. The Boss thought a big tarp might work. Our “big” tarp wasn’t all that big. Guess it’s time for a trip to town. Oh...argh. these blasted rats are costing us a fortune! While he drove, I searched on-line. Thankfully, Lowe’s had something that would work. A short time later and hoophouse #1 is adorned in a big, blue tarp. Not the best solution (too small and too dark) but, at least the work I’ve done will have a fighting chance until the shadecloth arrives. 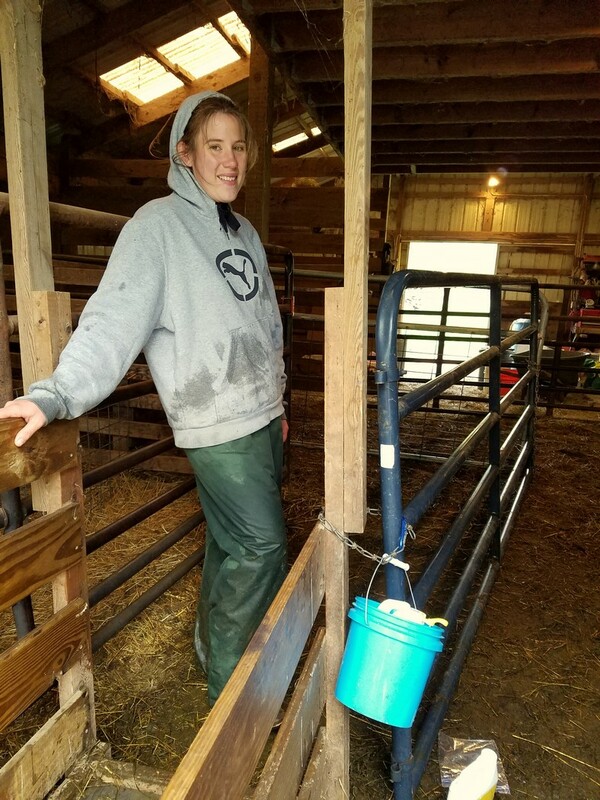 During the weaning process, it’s not unusual to hear lambs screaming (as a matter of fact, we should probably post some sort of warning for the entire community) But, when I heard a lamb yelling when I stopped at the gate, I knew we had a bigger problem. Someone was stuck in the fence! For three days, I pulled stuck lambs out of various fences. And, the Boss questioned my ability to hook up the electric fence. Finally, he realized that there was a break in the wire and there was no voltage on the fence. A quick fix and no more stuck lambs! apparently she's not happy to be "free"
"if you just turn the wrench this way..."
But, there’s far more than physical work required by the current situation. It seems like it’s time to do some assessment and analysis and perhaps re-evaluate a number of things. However, every time I attempt it, I find myself in an existential quandary, somewhat defeated and completely overwhelmed. I’ll be perfectly honest here…I’m seriously not lovin’ the Market lately. It’s just been hard. Sales are down because we simply don’t have the produce for sale. We don’t have the produce because there are not enough hours in the day for one person to do everything. And, a whole lot of people just don’t get this. More than once I have started seeds only to watch them get overgrown and die in the flats because I can’t get them planted in the hoophouse. And, while I truly appreciate all the offers of help, to attempt to coordinate helpers, the weather, the Boss’ needs and concerns along with my own abilities becomes even more overwhelming. It can be excruciating to repeat “the story” and give countless updates, partly because there is no escaping the fact that we’re probably never returning to our “normal” life ever again. But, like it or not, the Market is what we do. And, if I had missed the Market, I would have missed an amazing encounter. Upon my return to our stand, I saw the Boss involved in conversation with a couple I didn’t recognize. They introduced themselves as Anne and Jim from Georgia. Such gracious, kind people! But, they weren’t just your ordinary tourists passing through town. They wanted to meet US. They read the farm blog on a regular basis and planned their trip so they could come visit US. Now, that is special! They read the Weaver of Grass Click here to read., a blog about life on a farm in the Yorkshire Dales. I have followed this blog for a while and the author follows me as well. 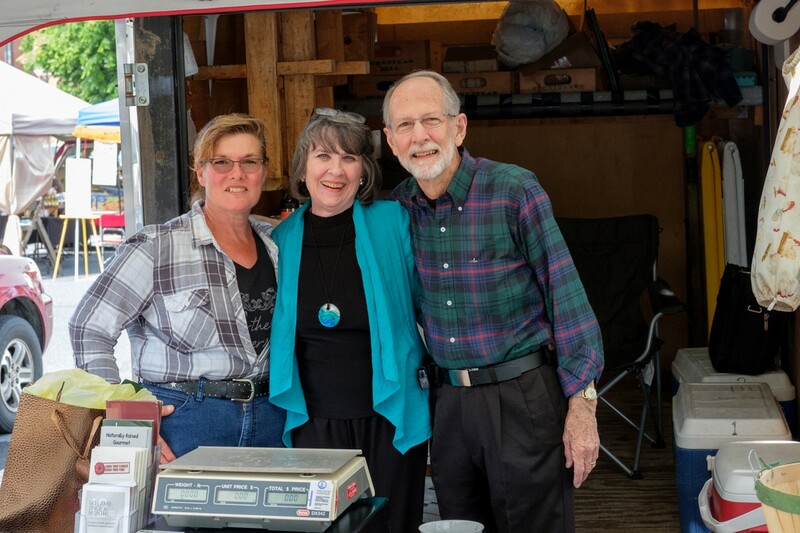 One blog led to another…and that led to Anne and Jim at the Staunton Farmers’ Market! It is indeed a small world. I want to thank Anne and Jim here for their visit. (and the gift) I should have gotten an address (please email me!) but “market brain” struck and it didn’t occur to me until they were well on their way again. Thank you for your kindness and concern. Thank you for making the effort to find us and encourage us along this journey. I am not sure I can ever communicate to you how very special it was to meet you and how your kindness touched me. Thank you doesn’t seem nearly enough, but I can assure you it is from the bottom of my heart. Please keep in touch! And, on that note…it’s time to close for the week. Oh dear, what a week. I completely understand and commiserate with your existential quandary...its easy to get lost in it if you let yourself go. I'm glad there was a big bright spot at the end of the week!! (PS do you want to borrow my rat terriers next Winter? They are probably as big a handful as the rats but maybe a wee bit less destructive 😉 their nickname is the demon hounds haha). Oh Barb - I do so understand your pain and frustrations! But, like you stated - just put one foot in front of the other - one day at a time! For no matter how we feel - life DOES go on! Animals need to be attended to - crops need attention. I am keeping you and the Boss in my daily prayers! I do hope to see the Boss back to his new "normal" self soon! God Bless! Press on brave and beloved friend!